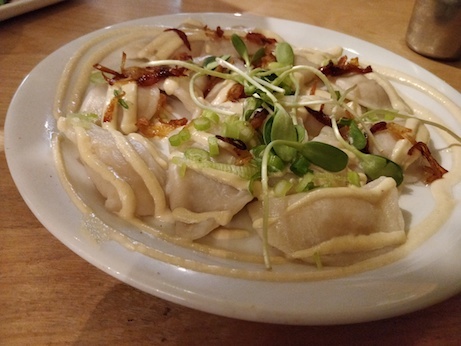 Vancouver – Indigo Age Cafe – vegan in your city. 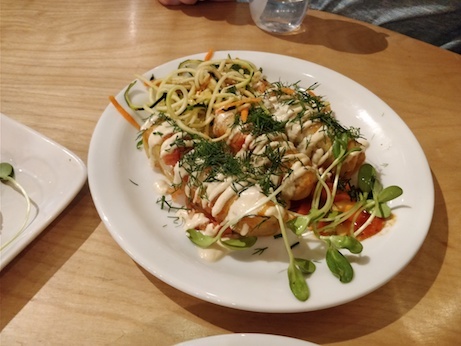 The first few times we saw Indigo Age Cafe come up on a vegan-friendly food list we mentally skipped it because we thought it was some raw food place and we’re not usually into that. But after repeatedly seeing it, I got curious – maybe it would hit the spot anyway. I really like salad rolls… so I took a look at the menu. And I’m so glad that I did. Sure, they have raw food, and plenty of it, but in a wonderfully unexpected curveball, they also have cooked vegan Ukrainian cuisine. Surprise! Pirogies! And cabbage rolls! And borscht! oh my. Something else they do that’s pretty neat is a Vegan High Tea. 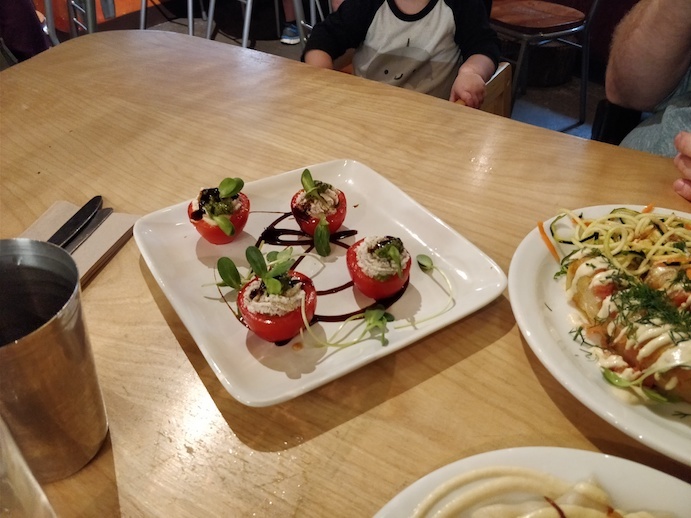 Several of the other tables were doing it while we were there – I kind of regret not going for it, but our small human was reaching the end of his evening tolerance, so we didn’t have much time and we weren’t sure how long it would take – but it looks great. And of course, we had to dip into the Ukrainian menu and ordered plates of assorted savoury pirogies and cabbage rolls. The pirogies had an incredible soft and tender dough, and were filled with sauerkraut or potato (they also have a cherry filled one that we didn’t order.) Drizzled with olive oil and a cashew cream sauce. Excellent. The cabbage rolls were not at all what I was expecting but I still liked them. They were long and thin rolls of cabbage stuffed with rice, mushroom and vegetables topped off with a cashew cream sauce and in a bit of stewed tomato sauce. We had a good time, service was friendly and we were left to enjoy our meal without any unhelpful interruptions. I’m glad we gave this place another look, and I’m gad we made it over there. Other things to know about Indigo Age Cafe: They take cash and credit, they have high chairs, and they are down a flight of stairs. It’s not a huge space, but they make good use of the space they have, tables aren’t too crammed together. They had a great looking dessert menu, but we didn’t have anything.